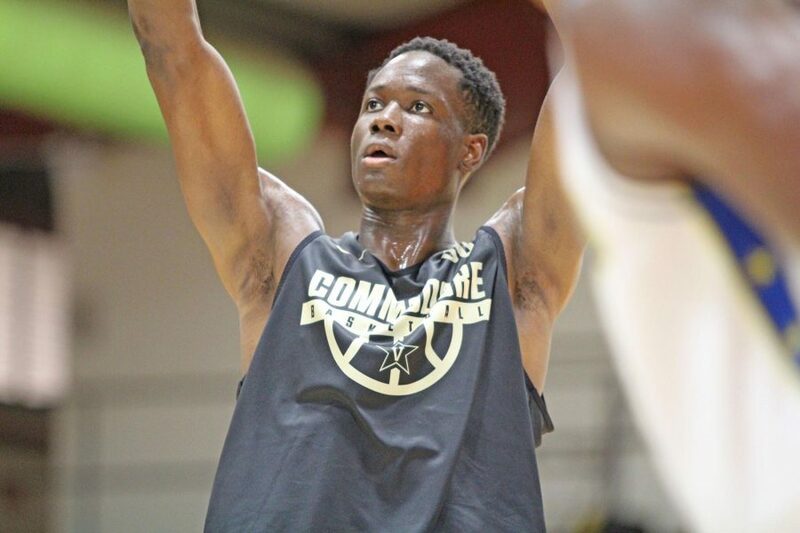 Ejike Obinna’s path to Vanderbilt is unlike any other. To tell this story it in its entirety, we must begin with ex-NFL wide receiver and Super Bowl champion Antwaan Randle El. Since his retirement from the NFL in 2010, Randle El has founded The El Foundation and now serves as the athletic director and basketball coach of Virginia Academy, Obinna’s alma mater. The El Foundation’s mission statement is “to mold a generation of young leaders who carry on the tradition of supporting their communities with caring and love.” Of course, most of the El Foundation’s influence comes through sports, namely their “Do Good Through Sports” campaign. “Bring him over here?” Where was he coming from? Basketball promo shoot 2017. Photo by Joe Howell//Vanderbilt University. Obinna had never picked up a basketball prior to 2013, yet he shined at a camp back in his hometown of Enugu, Nigeria, well over 5,000 miles away from Virginia. In fact, “Ej” played so well at the camp that he received recognition, and shortly thereafter, the call from Randle El. Randle El took a chance, and with the help of a host family, he was finally able to bring Obinna to Virginia. Years later, Obinna was part of Virginia Academy’s very first graduating class, and what once looked like a risky decision for Randle El had paid its dividends. 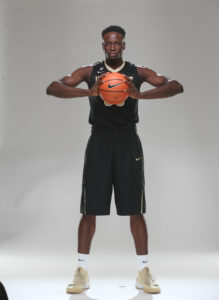 Ej finished his high school career averaging 16.6 points (scoring over a thousand points total), 8.0 rebounds, 2.0 blocks, 1 steal and 1 assist per game before committing to play at Vanderbilt University. His progression from a raw athlete to a force to be reckoned with is truly unheralded. If you couldn’t tell by the weather here in Nashville, Winter is coming. As frigid mornings loom over the Vanderbilt University campus, tip-off for a brand-new SEC basketball season approaches. While the transition from Nigeria to America was no crystal stair, one of the greatest discrepancies between the two countries, the climate, didn’t phase Obinna. Ej cited the culture, school system, and our tendency to speak fast-paced English as some of the harder adjustments he had to make. MBB Practice in Memorial Gym Practice Gym. Photo by Joe Howell//Vanderbilt University. Just months removed from high school, Obinna has been tasked with another huge transition. 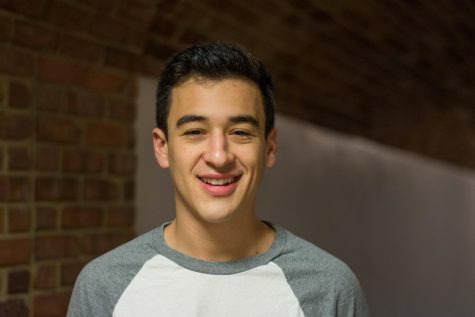 While he was a high school student in Virginia just last year, he must now acclimate to fast-paced SEC basketball, all while trying to settle in as a college student in a brand-new state. Thanks to the support system he’s built here at Vanderbilt, Ej made the transition appear seamless once again. According to Coach Bryce Drew, the team played a big role in this process. Ultimately, Ej’s transition could have an impact on Vanderbilt’s international recruiting moving forward. 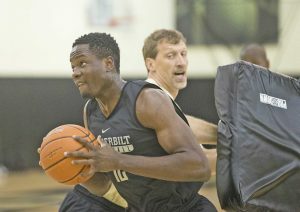 He is certainly not the first Commodore born in Nigeria–notables include NBA champion Festus Ezeli and Women’s Basketball prized recruit Blessing Ejiofor–but Coach Drew knows Obinna’s story, and more importantly, his potential impact. Why Vanderbilt? Why Coach Drew? Obinna received countless offers from major Division One programs all over the country. Eventually, he narrowed his search down to four schools: Clemson, Florida, Oklahoma, and Vanderbilt. According to Ej, no other school could boast a system that fits him as well as Drew’s, and no other school had a coach as lively or as personable. Ej isn’t wrong. Heading into just his second season as head coach, Bryce Drew has made a name for himself. Coach Drew’s ability to speak so highly of his players both on and off the court is indicative of his own persona. Drew didn’t hesitate in describing what Ej can bring to the team in just his first season as a Commodore. “He can certainly contribute great size, he’s aggressive, he rebounds very well, and he plays really hard,” he said. Likewise, Obinna is just as valuable of an asset off the court, as Coach Drew couldn’t hold back laughter and excitement while describing Ej’s personality. Obinna is a family man at heart. Whether it be his family back home, or his second family in Virginia, he is grateful for all they’ve provided. When asked about his host family, his face immediately lit up with a big smile and his words carried a contagious sense of excitement. With the help of his family from home, his family from Virginia, a Super Bowl Champion and a lively coach, Ejike knows he has always had the tools to succeed. In the next few weeks, we will see how these tools will translate to the big stage. Featured photo via Vanderbilt Athletics.